Random Panel: Worst. Battle-cry. Ever. 9 Responses to Random Panel: Worst. Battle-cry. Ever. What, you ask, became of this union? Well, rumor has it that deep in the Texarkana swamps lives a mutated wildboy that howls at strangers and draws really well. This comic was written in the 1940’s right? Since their last names are different, I’m assuming they aren’t married. So an unmarried couple walks into a secluded room, and they watch each other change clothes? Wouldn’t this have caused a backlash back then? But, I guess this panel could also imply a new meaning for “never waste time”. 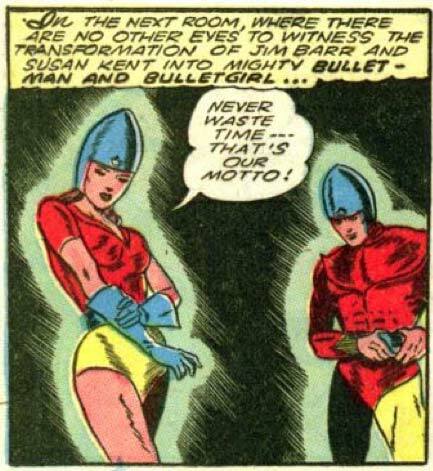 Poor Bulletman for being true to his namesake. That is an interesting perspective. Do you think she was taking a dig at him for being too quick to “fire off his bullet”? Dearly beloved, we are gathered here to witness the joining of these two bullets in holy bullet-matrimony (Batman!). I can’t help it, I’m still stuck on there being a Bulletdog…. So, she’s a Kent. Well no wonder noone can recognize her when she puts a helmet over her head. She’s related to Clark.